Today is the 100th anniversary of Clayton Moore’s birthday – otherwise known as The Lone Ranger. I remember watching it as a kid – I also named my stick horse Scout – Tonto’s horse. Interesting how things this year have reminded me of my Dad. I may not write about my Dad in chronological order, sometimes certain things come to mind that may be out-of-order. I think my first memory was about 3 or 4 years old, in the Manhattan Beach house. I have vague memories and pictures in my mind of chasing trains. I remember being at the front closet to get coats and go see trains, where I have no idea. My older sister Ellen might remember. I also remember walking on the tracks with my sister and Dad – used to frustrate me no end that I kept slipping off but my sister walked the tracks with no trouble. From my younger point of view, she always did things better than I did. 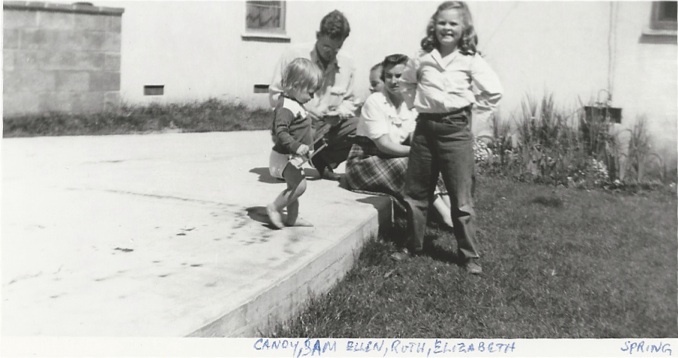 Ellen and I would play stick horses together, a long square stick that we tied thin rope at the top for reins. At one point, Dad took his jigsaw and cut out heads to put at the top – mine was painted like Tonto’s Scout, can’t remember what Ellen had. We enjoying playing with them, I know we played in the back yard but whether we went in the street I don’t remember. Again, just pictures in my mind. When Dad decided to accept a job with Boeing, we moved from Southern California to Seattle – for some reason Dad said we couldn’t take our stick horses – no room in the moving van, or something like that. That made no sense to either of us, so we weren’t too happy about that. Back yard of Manhattan Beach house – to the right is the yard, to the left up the drive, a 2 car garage. I was 7 when we moved about April of 1954, Ellen was 11. My parents found a house to rent in Madrona and things suddenly changed. I was in 2nd grade – turns out I went to school a year earlier than the other kids, so I was always a year younger during public school. (Mom and Dad always told the story of how much fuss I made to get on the bus with Ellen, so they let me go at age 5 – turned out not to be a favor after all.) I finished the last 2 months of 2nd grade and then went into 3rd grade. I think Ellen was in 6th grade by then. 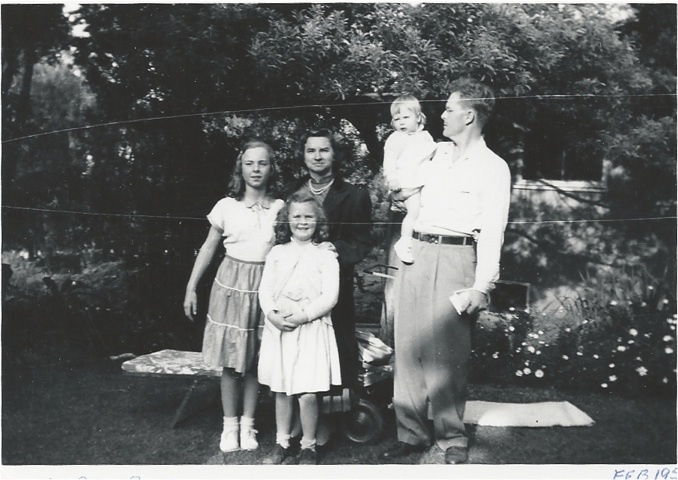 I remember one day in 1954, my Dad came home for lunch – very unusual for him. Then he and Mom stood out on the back porch watching a plane fly by – what was the big deal about a plane? It really was a big deal because it was the first flight of the 707 and beginning of the jet age. It was many years later that I knew why it was a big deal. When we moved to Seattle my sister Candy was about 18 months old and to us, a pest. Certainly not her fault, but there was 6 years between us and 10 years between Candy and Ellen. I also noticed Ellen wasn’t my playmate any more, by that time the 4 years difference was very noticeable. I was on my own a lot, seems to have been my history. She kept to herself more and I was probably a pest and nuisance by then. A year and a half later, my parents found this house – it had all the requirements – a large lot, a view, 4 bedrooms; I never thought I would be living here since 2002 and it is now mine. I now understand why my Mom wasn’t happy with the layout of the house, you have to go through the living room to get anywhere. The front door opens smack dab into the living room – wonder if that is why everyone goes to the back door, or is it the path leads to the back porch? Unfortunately she couldn’t explain it to Dad in a way he would understand. At Christmas time we would go down to Chubby and Tubby for our Christmas tree. The five of us would look around the lot and each found a tree – then we had to decide which one to buy. It often seemed to me that the best tree was always the one someone else was holding. We would choose one (sometimes one that needed the most love), take it home and put it in a bucket of water at the bottom of the outside stairs. It was usually a week before Christmas. Then we put it up on Christmas Eve, decorate it with ornaments Mom and Dad had collected when they were first married, new ones and ones we made. The cool thing was the next morning was Christmas. One Christmas we put it up a week before Christmas, didn’t work out all that well. Instead of Christmas coming the next morning, it seemed forever for it to come and I think we all were a bit tired of the tree when it finally came. So we went back to putting it up Christmas Eve and taking it down New Year’s Day. I’m curious to know what my sisters’ memories are, if they are very different. Funny how each person sees something, a person, or event at the same time and sees it differently. I have been going through pictures and these two were ones I found. Once again, to be continued.